The National Cancer Institute's Natural Products Branch at the Frederick National Laboratory for Cancer Research is the largest program to collect materials worldwide from marine, plant, and microbial sources so they may be studied for possible medical uses. Both a water and an organic solvent extract are produced for each organism that is brought into the lab. 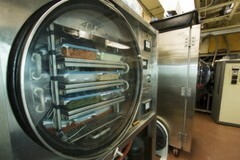 Water is removed from the extract by a process known as lyophillization, which is accomplished through the use of large freeze dryers (shown here).